This is a research based spelling program that has realized great success in helping students learn how to spell correctly. work and any additional practice at home during the week would be greatly appreciated. Students receive a word list and the teacher explains the word sort. Students will sort their words and write them in their word work notebook. Students will glue their words into their word work notebook. 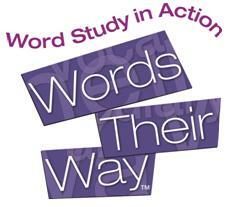 Students should practice and study for their word work test on Friday. They need to both spell and sort the words correctly. Students will be assessed on their words for the week.